A table that summarises change in rating questions, sorted by the amount of change. 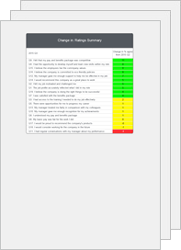 Useful for a compact summary of changes in all rating questions in a survey and for identifying those with high and low amounts of change in the latest period. The value cells in the table can optionally be coloured Red, Amber or Green ("RAG") to show positive, little or negative change. See Table Colouring and RAG target in Settings.